Embroidery patterns have always been popular due to the beauty they add to a well-sewed fabric. 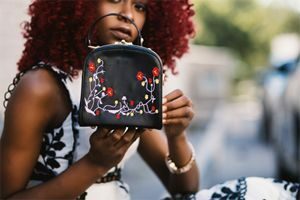 As a matter of fact, in most cases, embroidery patterns, otherwise known as monograms, are not only used to add a sense of beauty to a fabric but also serve as a unique way to advertise something. This is especially used by companies to advertise, whereby intricate patterns are embroidered on a cloth with the aim of calling to attention to their products or services. However, considering the wide range of embroidery machines in the market, all promising a superb monogramming experience, it can be quite daunting for any sewer; whether experienced or novices; to choose the best embroidery machine for monogramming. Guaranteed accuracy; especially if the embroidery machine being used is computerized. Dependable speed; compared to hand stitching monogramming machine always get the job done fast enough, without compromising on the quality. Ease of use; this is because these machines require a small amount of manual manipulation to get the job done. The machines come with additional features; this allows the sewer to designed intricate and customized monograms. Quality monograms; these machines offer the highest degree of accuracy thus ensuring high-quality monograms. They can be used to design for commercial and industrial purposes. They offer an ease of use by any sewer, whether experienced or entry-level. With the added features, monogramming machine facilitates creativity. Price range; you should buy a sewing and monogramming machine that falls within your budget range without compromising on the quality. Ease of use; the best monogramming machine is one that best compliments your sewing skills. Throat width. Throat width is the distance between the needle and the body of the machine. The wider the throat width, the easier it is for a machine to embroider cloth. Features. It is the extra and unique features in a monogramming machine that counts. These features facilitate efficient quilting and embroidery. The Brother SE400 embroidery machine a fully computerized machine. Its comes with an easily downloadable Brother software that features loads of designs and great patterns. The machine offers both sewing and embroidery functions all in one unit, thanks to its 70 inbuilt embroidery designs, 98 stitch functions, and 67 sewing stitches. Additionally, the machine ensures you get high-quality embroidery experience by providing a 4 by 4 embroidery area; which is large enough to handle any sort of project. 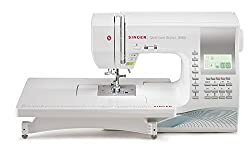 With the combination of an automatic needle threader and LED light that makes it easy to not only see the object clearly but also help you make miniature designs; sewing with the Brother SE400 sewing machine is a breeze, no matter your sewing skills. The machine is best for beginners since it is easy to use. The machine best suits quilters with its 70 inbuilt embroidery designs. Any sewer looking to upgrade to a computerized sewing machine. The free-arm design allowing you to take up large quilting designs. Offers high-end features at an affordable price. Features downloadable designs thus giving you a wide range of designs to use. Easy to thread the machine due to its automatic threader. Easy to set-up and get started. Has lightweight design making the machine portable. Maybe a bit confusing for beginners, but it has an easy to follow instructional manual. The Brother SE400 offers what most sewing machines don’t offer, a large working space. This makes the machine rank high among the best embroidery machines in the market right now. 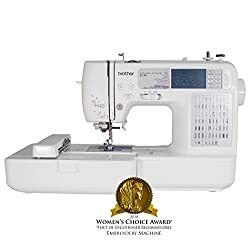 The machine also adds to the list of favorite sewing machines for professional sewers since it is rich in features and offers intricate embroidery designs. The Singer quantum stylist 9960 is a computerized sewing machine that offers more than just an abundance of stitches- 600 stitches to be exact. The machine features an automatic threader that makes threading easy and fast as well as eliminates the chances of pricking your finger if you were to manually thread the machine. The bobbing system of the machine has a clear cover that allows you to clearly see the state of your bobbin so as to know when to refill with the top drop-in system. The machine offers a high degree of user-friendliness and the ability to take a wide range of sewing projects including embroidery and monogramming. Inter-mediate sewers, since the machine is user-friendly with a few extra features. Anyone looking for an affordable computerized sewing machine. Sewers working on heavy-duty fabric. Professional quilters since it has an amazing sewing speed for faster results. Creative sewers looking for a variety of designs. The machine has programmable patterns to allow for diverse designs. Automatic threader making easy and fast to thread the machine. A bobbin system with a clear cover for clarity. Wide LCD screen that makes it easy to choose stitches with ease. The machine has a self-cutting thread feature making it convenient to cut the threads. Offers a variety of decorative features. Speed controller slide that lets you regulate the sewing speed. Stitch editing abilities to allow for creativity. Features free-arm to allow for versatility. The buttonhole quality is questionable. The product does not come with a quilting tray. Despite offering the typical features found in all computerized sewing and monogramming machines, this machine is built to last. The machine also suits inter-mediate sewers looking to upgrade from a standard sewing machine to a computerized one, without paying a ton of money. The Brother CS6000i sewing machine is a fully-featured, computerized monogramming and sewing machine that guarantees quality results with fewer mistakes. It features a 60 stitch collection that offers consistency, and nine included presser feet to unable users perform a variety of tasks from plain stitching to embroidery. The machine also features an LCD backlight screen which allows the sewer to adjust the stitch width and length. The Brother CS6000i is ideal for beginners that offers a user-friendly interface. Any sewer working on light projects or just for home use. If you are looking for an affordable machine with all the necessary features for sewing. If you are tired of your noisy machine then you might consider the Brother CS6000i. 60 built-in stitches including quilting and other decorative stitches. LCD screen that allows for easy reading. 7 styles of 1-step buttonholes. Extra accessories such as seam ripper, needle set. The machine is strongly built thus ensuring durability. It is easy to set up and use. Has a variable speed controller that lets you regulate the sewing speed. Comes with a protective carrying case to protect the machine from damage. Provides a wide sewing table that is great for quilting. The machine lacks enough power for sewing thick layers of fiber. 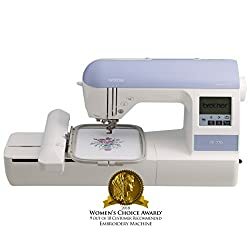 At a very economical price, you get a computerized sewing machine with all the necessary sewing features and tons of accessories. The machine also offers impressive performance and speed without producing much noise. On top of it all, the machine is backed with a solid 25 years warranty, making it hard to beat in this price category. The one outstanding feature that makes this machine a popular choice among sewers, is the 5 inch by 7-inch embroidery field that allows you to stitch large designs. This large space also allows you to rotate, combine designs, letters, and borders just the way you want it. In addition to the typical automatic threader, the machine features an LCD screen that lets you see what your design will look like before stitching. However, despite all these, the machine as not as sturdy as other Brother models hence may break easily. Any sewer who works on large fabric designs. A professional sewer looking for versatile designed stitches. If you want a simple computerized sewing machine for domestic projects. 5 inch by 7-inch embroidery area. Has 10 professional and elegant buttonholes. Has an automatic threader making it easy to thread the machine. Has jam-resistant, quick-set top- load drop-in bobbin system. LCD screen that visualizes a design before stitching it. Offers a large embroidery area that lets you work on large fabrics. Allows you to edit the design using the LCD screen. Automatic features that improve your sewing experience. The stitch speed can be controlled. Some users complained about the poor craftsmanship of this machine which renders it less durable compared to other Brother sewing machine models. If you are looking for a sewing machine with precision to monogramming then the Brother PE770 is the machine for you. This is because the machine not only has a monogramming foot but also features a walking and darning foot that eliminates the chances of uneven stitching and other quilting problems. Moreover, the machine has a sideways feature that enables sewing without rotations. The Singer Futura XL400 sewing and embroidery machine is a light-weight machine with a compact design hence its portability. This 30 built-in stitches sewing machine comes with 2 fully automatic one-step buttonholes and 125 built-in embroidery designs for the creative quilters. The machine also allows you to customize your embroidery on your PC or desktop and transfer them to the machine using a USB cable. The machine can be a great addition to your home embroidering. If you need a large work embroidery loop. If you are looking for a budget-friendly computerized sewing machine then the Singer Futura XL400 is the one for you. 125 built-n embroidery designs with five fonts and outline lettering. LED lighting making it easier to view your work. Great home embroidery with a large hoop. Easy to thread thanks to the automatic threader. Comes at a pocket-friendly price. Comes with 25 years warranty on the sewing head machine. The machine is a bit complicated for novices to use. This machine offers a value for your money by offering some amazing features which would be hard to find in other machine models within the same budget. The machine also delivers quality results, especially for all your home embroidery. 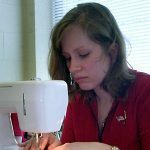 Investing in a sewing machine that meets your sewing needs as well as complement your sewing skills, is crucial when it comes to the art of sewing. This is why you should do a diligent search before purchasing any machine. 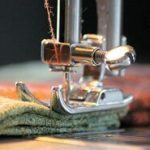 Although it narrows down to what kind of fabric are using, the kind of projects you are handling- whether heavy commercial projects or simple home embroidery needs, there is one common factor that plays a huge role when buying a sewing machine, that is, the functionality of the machine. This simply translate to whether the machine can be deliver the kind of sewing results you want. With the combination of the above-listed factors to be considered when buying an embroidery machine, use the review above to help you shed light on which kind of machine is suitable for you .